How Tia Lola Learned to Teach by Julia Alvarez. A Tia Lola Story. Review: Did you ever think that one person had the ability to influence and change a whole town? How Tia Lola Learned to Teach by Julia Alvarez is a great book. This is the story of how Tia Lola influenced a whole town just by helping everyone out in a small way. This is an amazing story about how Tia Lola, Miguel and Juanita's aunt, arouse their whole town. In the story "How Tia Lola Learned to Teach ," Tia Lola helps out their whole town in many ways. In the beginning of the story, Tia Lola is called to volunteer at Miguel and Juanita's (her niece and nephew) elementary school. At first, Tia Lola does not know what she is being asked to do there. She is needed to help teach Spanish at the school. She is worried that she will not be able to teach because she never went to school. She stopped going to school when she was very young. Tia Lola does not want to volunteer at the school now that she knows she will be teaching there. Will Tia Lola get her courage and go teach at the school? One more way that Tia Lola helps out the town is by helping a friend with his restaurant. She cooks for the restaurant and she gives dance lessons. Every Friday night, she teaches the customers of the restaurant a very special Mexican dance. She also cooks original Mexican food for them. Some customers come just to eat the food and also to learn the dance. This is the most special night of the week at the restaurant. Everyone loves it! Another way that Tia Lola helps out the town is by helping one of her niece's friends. With the help of her niece Juanita, Tia Lola gives Juanita's friend, Ofie, a half birthday party because she is not allowed to have birthday parties. They turn a Spanish holiday, the carnival, into her half birthday party. For the carnival, they need costumes, so Juanita gives Ofie her old Halloween costume to use. Another exciting thing that happens in this story is that the United States Department of Immigration sends Tia Lola a letter saying she has to leave the country and go back to the Dominican Republic. This means that she can no longer live in the United States because her visa has expired. The whole town is sad because she has helped out everyone in the town in some way. The letter says that she must go to the immigration center that week and leave. When the rest of the town hears this, they try to think of a way to convince the people at the Immigration Center to let Tia Lola to stay. To do this they all go to the immigration center on the day that Tia Lola is being asked to leave, and they tell the judge there how much Tia Lola helped out the town. They think that by telling him this, it will convince him into letting Tia Lola stay. This is the second story out of four Tia Lola stories. I thought that this story was great. If I had to rate this story, I would give it a rating of 4.5 out of 5. This was an enjoyable story, and I would recommend it for children of all ages. If you like this story, you should read the other Tia Lola stories by Julia Alvarez. 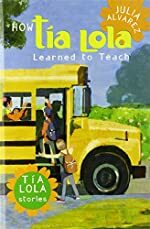 We would like to thank Random House for providing a copy of How Tia Lola Learned to Teach for this review. Have you read How Tia Lola Learned to Teach? How would you rate it? Great review! You are making me want to read this book. You were very specific and youdid not give the ending of the book away!